A UBS report compiled a roster of major crude oil projects – those with expected production of more than 100,000 barrels a day – due to come on stream through 2015. With rising demand, plus declining production from existing fields, the industry needs to add at least 4.5 million barrels a day of new supply each year. But relying on major projects won't meet that target according to UBS. 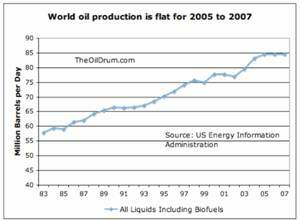 In the current year the analysts estimate new supply sources will produce 4.4 million barrels a day, but that figure drops to 2.9 million in 2009 and a paltry 1.7 million in 2010. 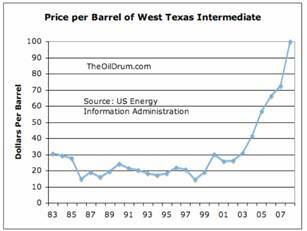  Two interesting charts were published by Gail Tverberg on the OilDrum.com last month. 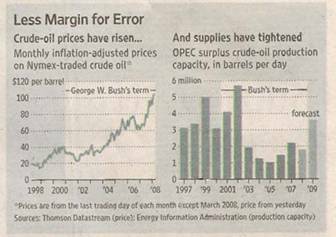 They illustrate the trend in crude oil prices to much higher levels – while at the same time global production seems to have leveled off. If production does not increase, expect prices to continue to trend upward. 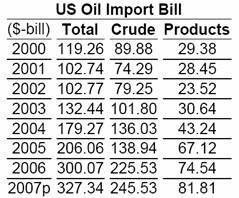  The recent run-up in U.S. natural gas prices can be partially attributed to the low level of liquefied natural gas (LNG) imports into the Lower 48 States according to the U.S. Energy Information Administration (EIA). LNG cargoes have been heading to Europe and Asia , where buyers continue to purchase LNG at much higher prices than have prevailed in U.S. markets. The reduction in imports to the U.S. reflects changes in global demand for LNG. Japan , the world's largest LNG importer, is relying more on LNG as a fuel for electric power generation. Some countries in Asia and Europe rely on LNG imports as a primary source of natural gas. China 's only LNG facility may double purchases of individual liquefied natural gas in 2008 according to official sources. The terminal bought seven individual cargoes for immediate delivery last year. The company is in talks to buy additional LNG on multiyear terms as it increases import terminal capacity. Utilities in Japan and South Korea paid as much as $20 per million British thermal units this winter, more than double the U.S. benchmark price at Henry Hub, Louisiana . Ocean shipping regulators and industry participants are debating how to reduce harmful sulfur dioxide emissions from their ships. Part of the industry, led by an independent tanker owners' organization, advocates a total ban on high-sulfur marine fuels in favor of lower sulfur diesel fuels. The International Maritime Organization (IMO), the UN agency responsible for preventing pollution from ships, will consider the controversial fuel proposal. The switch to diesel at sea would increase global demand for that fuel by the equivalent of one-and-a-half times the annual automotive diesel consumption in Europe . China 's fast-growing economy adds one coal generating plant a week. With raw-materials prices rising and the global economy slowing, what has surprised some analysts is how insatiable the appetite for energy is—and the implications that has for the rest of the world. China 's nuclear power sector is also growing faster than expected. The Chinese government is now shooting for 50% more nuclear power than originally planned, with generation capacity coming very close to the output of France . In France this level of generation equates to 80% of the nation's electricity supply; the same amount in China would meet roughly 4% of demand. What this demand will do to global uranium prices, which have already gone vertical in the last five years, is anybody's guess. China 's leaders are facing renewed pressure over shortfalls in diesel and gasoline, with lines growing at filling stations in major cities as the gap widens between international crude oil values and centrally controlled fuel prices. The shortages, first reported in southern and inland China , appeared to be spreading to the wealthier coastal areas as filling stations struggled to get shipments from refiners. More imports might be required to address these shortages.